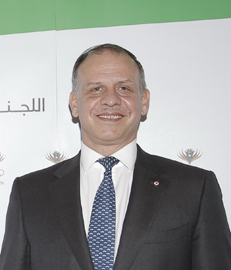 His Royal Highness Prince Feisal Al Hussein, has been the President of the Jordan Olympic Committee (JOC) since 2003. Ever since the beginning of his term, His Royal Highness has made significant changes and greater positive impacts on the Jordanian sports scene. From his vision for sports and healthy living to play a part in the lives of all Jordanians, the JOC began its tireless efforts to adopt those principles and turn them into a reality. And through his careful planning and steady work, His Royal Highness managed to position the Jordan Olympic Committee as one of the most respected National Olympic Committees in the world. In 2010, HRH Prince Feisal Al Hussein became a member of the International Olympic Committee proving again the significance and importance of the role he played in promoting sport for all and that Jordanian efforts in bettering the sports community around the world will not go unnoticed.